Helen R. Eckert, age 91, of Jasper, Indiana, passed away at 11:20 a.m. on Sunday, June 17, 2018, at home. Helen was born in St. Anthony, Indiana, on July 27, 1926, to Leo C. and Mary (Theising) Wehr. She married Mathew "Butts" Eckert on November 23, 1943, in St. Joseph's Catholic Church in Jasper. He preceded her in death on October 12, 1979. Helen retired from Jasper High School, where she worked for many years in food services. Previous to that she was a homemaker and then worked as a hostess and waitress at the former Heritage Inn restaurant in Jasper. 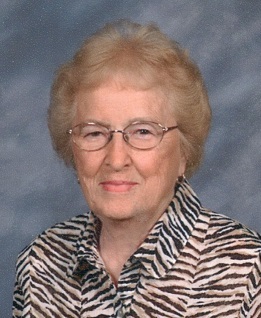 She was a member of St. Joseph's Catholic Church in Jasper, and the St. Ann's Society. She enjoyed gardening, working outdoors, fishing, babysitting, playing games with her great grandchildren, and spending time with her family. Surviving are one son, Charles (Gail) Eckert, Jasper, IN, four daughters, Phyllis (Kenneth) Oeding, Ferdinand, IN, Carol (Mike) Toy, Dale, IN, Gloria (Charles) Bueltel, Jasper, IN, Linda (Frank) Goeppner, Jasper, IN, one son-in-law, Gene Mehne, Portersville, IN, 15 grandchildren, 33 great grandchildren, and one step-great grandson. Preceding her in death besides her husband, are one daughter, Jan (Eckert) Mehne, and one son, Edward J. Eckert. Helen was the last surviving member of the Leo Wehr family. A Mass of Christian Burial for Helen Eckert will be held at 11:00 a.m. on Thursday, June 21, 2018, at St. Joseph's Catholic Church, with burial to follow in Fairview Cemetery. A visitation will be held from 2:00-8:00 p.m. on Wednesday, June 20, 2018, and until the service time on Thursday at the Becher-Kluesner Downtown Chapel in Jasper, Indiana. The St. Ann's Society will pray a rosary at 1:30 p.m. at the funeral home.